Share the post "Dec 2014:Commodities: a 150 year history"
The raging topic of discussion almost everywhere in business circles today is the sharp drop in the price of oil and what impact it has on different countries / companies. It is interesting to note here that it is not just oil that has seen such a dramatic fall in price. A number of industrial commodities such as iron ore, coal, and copper have seen dramatic price corrections over the last 2 years. And it is not only industrial commodities – US corn prices have halved over the last 2 years and wheat has seen a similar price drop in international markets. The reason cited for this is the low economic growth, particularly in resource hungry China. However, if one goes back a long way in time one finds that commodity prices have actually been trending down for the last 150 years. 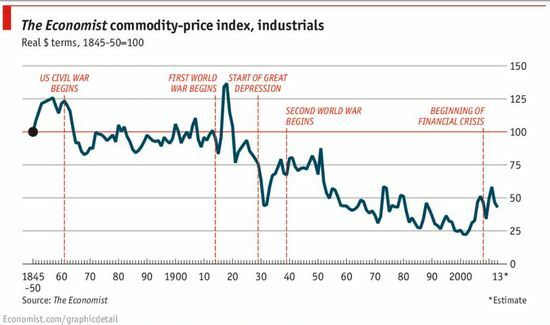 Please see attached price graph published by the Economist, which shows that the overall commodity index has been trending downwards over a very long period of time. From time to time, such as the bubble of the 1920s and recently from 2000 to 2007, there have been upward spikes in commodity prices but eventually, these have just been contra-trend rallies in a very large bear market. The cause for this relentless downward trend seems to be innovation and improvement in technology over the years. The price of oil had inexplicably held up for the last few years, despite large incremental supply coming out of the US and slowing demand in China. With the US wanting to pressure Russia for their involvement in Ukraine and the Saudis keen to disrupt fresh investments going into shale oil and gas exploration in the US, the supply has remained intact while demand has clearly slowed in China and Europe. Meanwhile producers like Russia, Venezuela, Ecuador etc are heavily dependent on revenues from oil to meet their budget targets and therefore can’t reduce production. The only player who can potentially reduce production is Saudi Arabia but they have clearly shown their intent not to do so. India is potentially a big beneficiary of the fall in prices of oil, coal, iron ore and other commodities because it is a large importer of these commodities. Moreover, with subsidy on diesel having been eliminated and the government slowly upping excise duties on oil products, there is a major positive impact on the budget deficit as well. Moreover, with commodity prices falling across the board, there is a significant downward impact on inflation which has been one of the main concerns in India, which has impeded consumer spending at one end, and not allowed the RBI to cut interest rates which have ruled at fairly high levels compared to the rest of the world. The 10 year government bond yield has already fallen over the last few months, and it appears only a matter of time before the RBI begins to cut rates. So, with a positive impact on the current account deficit due to lower imports, which should be beneficial for the rupee and a positive impact of lower subsidy outgo, which should reduce the fiscal deficit, the oil price drop means significant positives for the Indian macro situation. Add to that, the drop in prices in other commodities and the impact that would have on household budgets and we have a fairly nice cocktail of positives for the Indian economy. True – the drop in oil represents global economic weakness and exports in this environment would be difficult. Fortunately for Indian IT services companies, the big market is the US which in the most recent quarter, reported the strongest growth in several years. Europe too seems to be increasing the extent of outsourcing. That said, we remain focused on our effort to buy high quality companies at reasonable prices.